Patrick McGoohan- actor, director, murderer. He’s a triple threat! 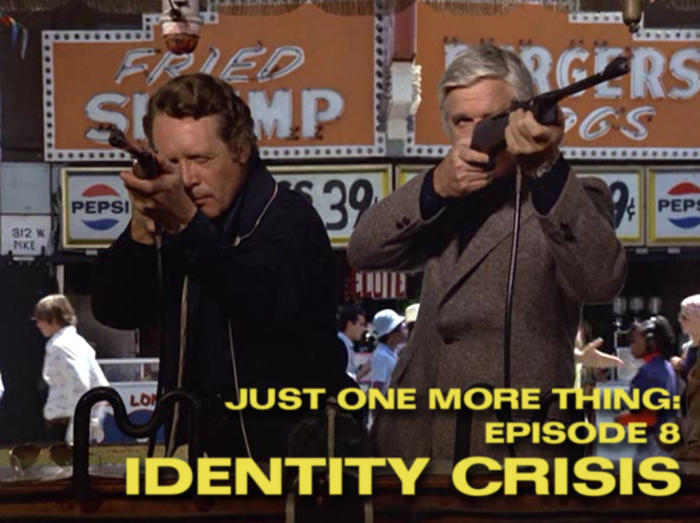 Molly Eichel (AV Club, Philadelphia Daily News) joins Jon and RJ to talk about “Identity Crisis,” a season five episode directed by McGoohan and co-starring Leslie Nielsen (for the first 20 minutes, at least). Spies, lies, fancy houses, CIA agents, amusement parks, halter tops and class issues aplenty await. I really think you guys should go back to the way you did the first one (Swan Song) where you go through the show scene by scene. That might help keep the conversation on topic. I think there was like 10 minutes of talk about boardwalks in the middle there. Your guest didn’t have a whole lot to say this time but at least it seems as though she likes it so that’s good. I’m glad you touched on the scene with the young girl. All the scenes that involve kids in Columbo seem to have a certain level of weirdness to them. I like this episode even though the plot is a little convoluted. McGoohan and Falk play so well together. Being close personal friends probably helped in that. My favorite McGoohan episode is Agenda For Murder. I guess you’ll get around to doing that someday. I’m a huge fan of “Agenda for Murder”. It of course has the classic flasher joke, and also has one of my favorite comments made about Columbo by an antagonist, “he’s got an act you could take on the road”. Glad you enjoyed this one more, and yeah, it’s a great episode with a lot going for it. We’ve considered the format, and we like the non-sequential approach. It encourages organic conversations about the episode with the freedom to jump back and forth wherever we find points of interest, and make more genuine if sporadic connections. With regards to the question of whether the Netflix episodes are remastered. They are. Netflix is streaming in them in HD and they look gorgeous. The way television was broadcast in the seventies would have made the image much muddier. Sadly, the only Blu-rays of Columbo were released in Japan. We know that they exist, so why won’t Universal release them in the states? I liked the big turn in the game room too. McGoohan’s character had been laying on the power trip so hard , and then suddenly he knew it was over, and it was his own dumb fault. He couldn’t even regret saying too much; his downfall was in his ostentatious furniture. I also liked that Columbo never got angry in that scene, even though his home had been violated by a government employee. However I do wonder if he rants to himself in the car after a situation like that. Nice job, you touched on all the things I hoped you’d touch on, like Melville abusing the sketch artist, and Columbo’s gratuitous fat joke. Your episode title is fine, but mine would have been “I’m talking about heat from a heavy little dude named Columbo!”. Yeah, but we’re only eight episodes in and have to hope we can rely on that sweet, sweet search traffic from “The Prisoner” nerds. Your scheme worked! Prisoner/Columbo nerd here. Excellent podcast. I do feel compelled to add a footnote re: McGoohan’s origins. He WAS born in NYC, but he immigrated back to Ireland with his folks when he was still a baby. He was effectively Irish/British. Thank you for a fun episode – it provided me with a much-needed chunk of entertainment during some jetlag-induced insomnia. I so richly enjoyed the city/boardwalk-related comparisons and jests, the pun-filled plot summary, and the One More Thing at the end, along with everything else. I hope you are enjoying making this podcast; I enjoy listening. Yes, we are enjoying it so far, but that is about to be sorely tested by the next one. You’ll be TESTED for Mensa? That is, “The Bye-Bye Sky High IQ Murder Case”? Or in an exam, implying “Columbo Goes to College”? It’s a TEST like a cricket Test match, thus, “The Most Dangerous Match” (even though that’s chess)? SORE like muscle soreness, hence “An Exercise in Fatality”? Or like a tooth, as in the dentist ep “Uneasy Lies the Crown”? This is our best comment ever. Please have Glenn on as a guest! Glenn will straighten you idiots out! Damn straight. How anybody that has seen “Undercover” could still think “Strange Bedfellows” is the worst episode is mind boggling. I don’t know who Peter Falk was playing in that episode but it sure as hell wasn’t Columbo.